Buffalo doesn’t really have much of a seafood scene (although, like the rest of the foodie scene in Buffalo, it’s growing). And while I love eating seafood, I just don’t happen to do so that often. The most impressive seafood experience I’d had in my life prior to this summer was surely at Kødbyens Fiskebar in Copenhagen, Denmark. But that all changed this July, when I spent some time in the heart of New England: at my friend Brooks’ cottage on Orr’s Island in Harpswell, Maine. For the entire weekend, our diets consisted of only seafood and white wine (okay, we had hamburgers – once). Never before had I seen such an abundance of fresh, locally harvested, and cheap seafood! We were buying lobsters (daily, or more than daily) down the street for only $2.99/lb. and went to the local market more than once to stock up on scallops, mussels, steamers (clams), and other ingredients. And every time we went out to the best (and only) restaurant on the island, I ended up ordering the same thing: a fantastic Maine lobster roll. The trip to Maine (and my tour of New England: NH, MA, ME, CT) left me with an insatiable want for more seafood. So while I knew it wouldn’t be the same, I picked up a few pounds of mussels my (very) first day back in Buffalo and cooked them up for dinner before heading down to the harbor. And they were actually so good that I made them again even more recently when my friend Ave came over for dinner. They’re so simple to cook; cleaning them is probably the hardest part, but even that’s not too bad. The recipe I’ve been using is very basic, but endlessly delicious. It’s based off of Ina’s classic recipe, but I always end up using whatever I already have lying around the house: shallots, garlic, white wine, herbs, and some canned or fresh tomatoes. The only things to buy are the mussels and some crusty bread! And it really is the best kind of recipe to make with friends or while entertaining. There’s little prep work and a good amount of downtime (cleaning and steaming) – perfect for sipping on some chilled white wine while chatting away and awaiting a deliciously light summer dinner. Clean the mussels: First, pull any remaining beards off by firmly grasping the mussel and pulling the beard toward the end of the mussel with some force. 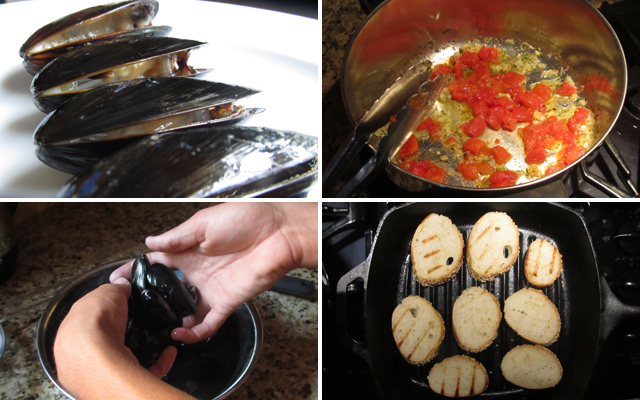 Discard any mussels that are already open. 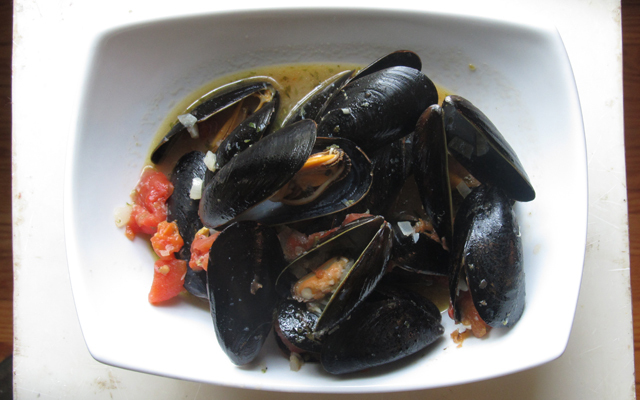 Then, rinse the remaining mussels and remove any algae or sediment on the shells. Finally, fill a bowl with water and throw in a handful of flour; mix. Place the mussels in that mixture and let them self-clean for a good half hour. 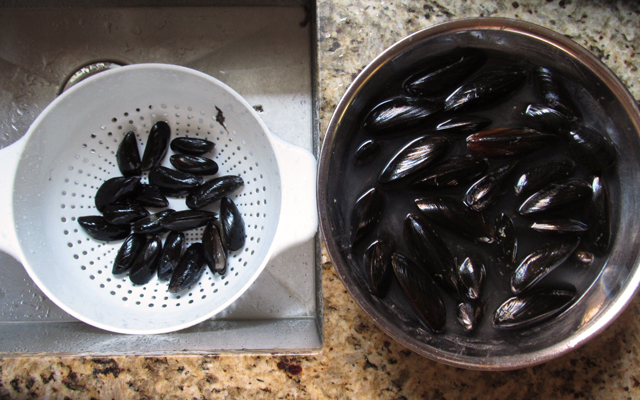 When done, lift mussels out into a colander, leaving all the sand and grit behind. In a stockpot or dutch oven, heat the oil and butter with the sliced shallots; cook for about 5 minutes until translucent. Stir in the grated garlic and cook for only 30 seconds. Immediately stir in the tomatoes and cook for another 30 seconds. Finally, stir in about 1 tbsp kosher salt, a pinch of pepper & chili flakes, and whatever herbs you’re using. Finally, pour in the white wine and bring to a low boil. Lower in the mussels and lower the heat slightly; cover. Give the pot a good shake. Cook for 8-10 minutes, shaking once or twice with the cover on, until the mussels have opened. Discard any that do not open. 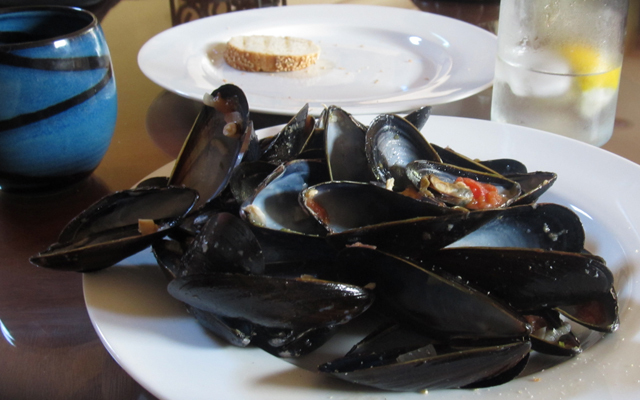 Enjoy the mussels and the broth with a crusty and/or grilled baguette!